Tube feet, and now a mention of a koel? You probably were expecting to see a post about marine life, but before that, I thought I'd give a short 'welcome' post. Living in such an urbanised world, it is easy to relegate nature to the periphery though it is all around us. After all, what one usually sees first are buildings, buildings...and more buildings...especially for those of us who stay in high-rise flats or apartments. In the morning when I first open my eyes, that's what I see, and a curve of the sky. Doesn't sound too bad, I know. Sometimes though, before wakefulness approaches, I hear the insistent cries of 'ko-el, ko-el, ko-el!' and in that moment, I can imagine that I'm out in the wild. 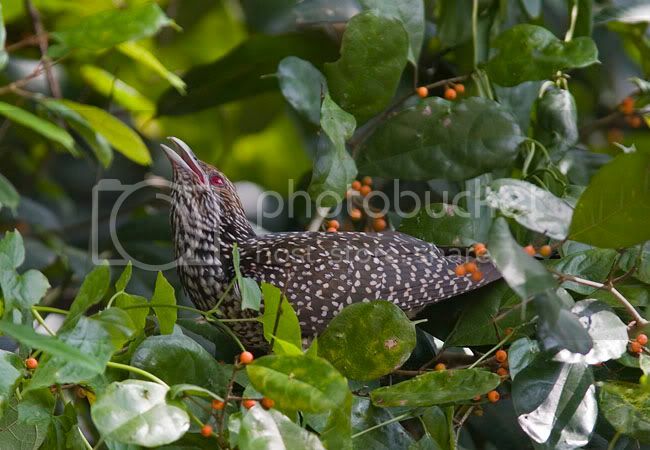 So, Mr, Mrs or Ms Asian Koel (Eudynamys scolopacea), I just want to say thank you to you for being such a great reminder! Random: There was once when I was out windsurfing and couldn't get back to shore. Out of the blue, I heard the cries of the Asian Koel and felt encouraged to keep trying and trying. Quite surprised to hear its cry at ECP. In the end, I was towed back to shore by the powerboat though. Haha.